Los Angeles County Supervisor Janice Hahn launched a new Mobile Stroke Unit last month that will respond to stroke-related emergency calls in Cerritos as well as Artesia, Bellflower, Lakewood, Paramount, Signal Hill, Hawaiian Gardens, Norwalk, La Mirada and the area of unincorporated Whittier. A Mobile Stroke Unit is a specialized ambulance equipped with a portable CT scanner that allows medical professionals to diagnose and treat strokes in the field. By eliminating debilitating delays in treatment, mobile stroke units can save lives and prevent or reduce the long-term brain damage and disability associated with strokes. The region where the Mobile Stroke Unit will operate has one of the county’s highest levels of stroke-related incidents. In the past year, Los Angeles County Fire has responded to 818 stroke-related calls in the nine cities where the unit will operate, with 221 of those calls coming from Cerritos alone. 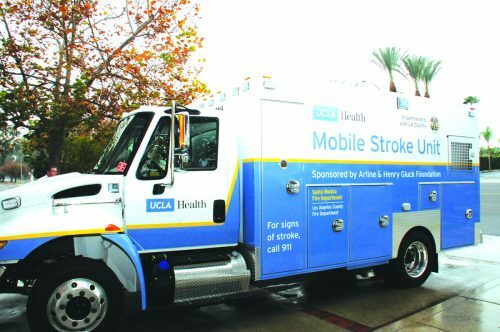 The Mobile Stroke Unit is part of a pilot program launched by UCLA Health and funded by the Arlene and Henry Gluck Foundation and the County of Los Angeles. We are grateful to Supervisor Hahn and UCLA Health for bringing this life-saving service to our community. With this new technology and the skill and expertise of those who operate it, precious time and lives will be saved. The City of Cerritos has produced a short video about the new Mobile Stroke Unit. The video includes footage from the special launch event in January, interviews with medical and law enforcement personnel regarding the benefits of this unit, and a look at the unit itself. The video can be viewed on Cerritos TV3 on the following dates and times in March: Friday, March 2 at 5 p.m.; Monday, March 5 at 5:30 p.m.; Thursday, March 15 at 9 a.m.; Sunday, March 18 at 6 p.m.; Monday, March 19 at 5:30 p.m.; Wednesday, March 21 at 5 p.m.; and Saturday, March 24 at 6 p.m. The video also is available for viewing on the City of Cerritos website and on the City’s YouTube channel.